Home » Feline Pine Natural Cat Litter 20 Lb. Feline Pine Natural Cat Litter 20 Lb. Healthy Home. Healthy Cat. 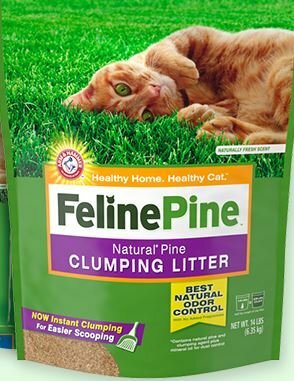 Feline Pine Clumping Litter contains natural pine and clumping agent, plus mineral oil for dust control. No new trees are cut to make Feline Pine products. Our natural* litter is made from kiln-dried shavings reclaimed from lumber production.